Sony has just announced its new project – 13.3-inch slate with e-ink touchscreen and stylus input support. 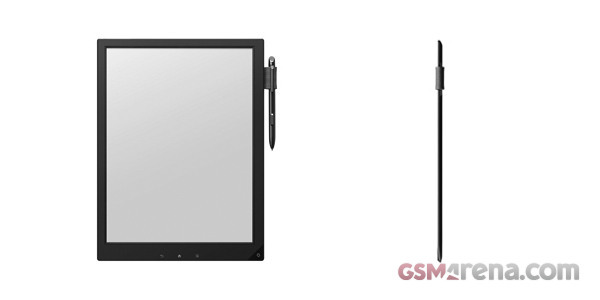 The tablet features a 13.3-inch flexible e-ink display with a resolution of 1200×1600 pixels, stylus-enabled touch panel above the screen, 4 GB of internal storage expandable via a microSD card slot, and Wi-Fi b/g/n connectivity. Currently, the prototype tablet is capable of taking notes, but supports only PDF documents. It’s about as big as an A4 sheet of paper at 233x310x6.8mm, and weighs 358 grams. Sony promises three weeks of battery life with the Wi-Fi turned off. Sony will showcase the tablet at a student expo in Tokyo in two days. If this tablet manages to get the attention of three Japanese universities, we might get to see it on the market in a few months.